Angels in America is a 2003 American HBO miniseries directed by Mike Nichols and based on the Pulitzer-prize winning play by the same name by Tony Kushner. Set in 1985, the film revolves around six New Yorkers whose lives intersect. At its core, it is the fantastical story of Prior Walter, a gay man living with AIDS who is visited by an angel. The film explores a wide variety of themes, including Reagan era politics, the spreading AIDS epidemic, and a rapidly changing social and political climate. HBO broadcast the film in various formats: two 3-hour chunks that correspond to Millennium Approaches and Perestroika, as well as six 1-hour "chapters" that roughly correspond to an act or two of each of these plays; the first three chapters ("Bad News," "In Vitro," and "The Messenger") were initially broadcast on December 7, 2003, to international acclaim, with the final three chapters ("Stop Moving!" "Beyond Nelly," and "Heaven, I'm in Heaven") following. 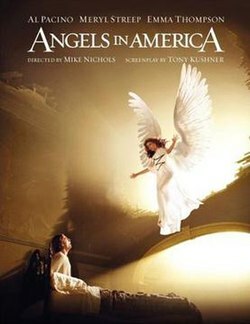 Angels in America was the most-watched made-for-cable film in 2003, and earned much critical acclaim and numerous accolades: at the 56th Primetime Emmy Awards, it became the first (and currently only) program in Emmy history to win in every major eligible category, and the second (and to date, last) program to win all four of its eligible acting categories (after 1956's Caesar's Hour). It also won in all five eligible categories at the 61st Golden Globe Awards. In 2006, The Seattle Times listed the series among "Best of the filmed AIDS portrayals" on the occasion of the 25th anniversary of AIDS. It is 1985, Ronald Reagan is in the White House, and AIDS is causing mass death in the Americas. In Manhattan, Prior Walter tells Louis, his lover of four years, that he has AIDS; Louis, unable to handle it, leaves him. As disease and loneliness ravage Prior, guilt invades Louis. Joe Pitt, a Mormon and Republican attorney, is pushed by right-wing fixer Roy Cohn toward a job at the United States Department of Justice. Both Pitt and Cohn are in the closet: Pitt out of shame and religious turmoil, Cohn to preserve his power and image. Pitt's wife Harper is strung out on Valium, causing her to hallucinate constantly (sometimes jointly with Prior during his fever dreams) and she longs to escape from her sexless marriage. An angel with ulterior motives commands Prior to become a prophet. Prior is helped in his decision by Joe’s mother Hannah and by Belize, a close friend and drag queen. Joe leaves his wife and goes to live with Louis but the relationship doesn't work out due to ideological differences. Roy is diagnosed with AIDS early on and as his life comes to a close he is haunted by the ghost of Ethel Rosenberg. As the film continues, these lost souls come together to create bonds of love, loss, and loneliness and in the end, discover forgiveness and overcome abandonment. The soundtrack of the series by Thomas Newman was nominated for the Grammy Award for Best Score Soundtrack Album for a Motion Picture, Television or Other Visual Media. Cary Brokaw, executive producer of the series, worked for over ten years to bring the 1991 stage production to television, having first read it in 1989, before its first production. In 1993, Al Pacino committed to playing the role of Roy Cohn. In the meantime, a number of directors, including Robert Altman, were part of the project. Altman worked on the project in 1993 and 1994, before budget constraints forced him to move out, as few studios could risk producing two successive 150-minute movies at the cost of $40 million. Subsequently, Kushner tried squeezing the play into a feature film, at which he eventually failed, realizing there was "literally too much plot," and settling for the TV miniseries format. While Kushner continued adapting the play until the late 1990s, HBO Films stepped in as producer, allocating a budget of $60 million. Brokaw gave Mike Nichols the script while he was working with him on Wit (2001) starring Emma Thompson, who also co-adapted the play of the same title. The principal cast, including Meryl Streep, Pacino, and Thompson, having recently worked with Nichols, was immediately assembled by him. Though Ben Shenkman had previously portrayed Louis in the San Francisco A.C.T. 's production (as well as portraying Roy Cohn in the NYU graduate acting program's workshop of Perestroika prior to its Broadway opening), Jeffrey Wright was the only original cast member to appear in the Broadway version, having won the 1994 Tony Award for Best Performance by a Featured Actor for his stage performance. The shooting started in May 2002, and after a 137-day schedule, ended in January 2003. Filming was done primarily at Kaufman Astoria Studios, New York City, with important scenes at Bethesda Fountain in Central Park. The Heaven sequence was shot at Hadrian's Villa, the Roman archaeological complex at Tivoli, Italy, dating early 2nd century. Special effects in the series were by Richard Edlund (Star Wars trilogy), who created the two important Angel visitation sequences, as well as the opening sequence wherein the angel at the Bethesda Fountain opens its eyes in the end, signifying her "coming to life". Review aggregator Rotten Tomatoes gave the series a 92% 'Certified Fresh' rating based on 24 reviews, with an average rating of 9.5/10. The critical consensus reads "In Angels of America, writer Tony Kushner and director Mike Nichols imaginatively and artistically deliver heavy, vital subject matter, colorfully imparted by a stellar cast." The New York Times wrote that "Mike Nichols's television version is a work of art in itself." According to a Boston Globe review, "director Mike Nichols, and a magnificent cast led by Meryl Streep have pulled a spellbinding and revelatory TV movie out of the Tony- and Pulitzer Prize-winning work" and that he "managed to make "Angels in America" thrive onscreen..."
In 2004, Angels in America broke the record previously held by Roots for the most Emmys awarded to a program in a single year by winning 11 awards from 21 nominations. The record was broken four years later by John Adams. ^ An AIDS anniversary: 25 years in the arts Archived June 22, 2011, at the Wayback Machine Seattle Times, June 25, 2006. ^ "Thomas Newman". Grammy. Archived from the original on 8 March 2019. ^ a b Edgerton, Gary Richard; Jeffrey P. Jones (2008). "10. Angels in America". The essential HBO reader. University Press of Kentucky. p. 136. ISBN 0-8131-2452-2. ^ Buckley, Michael (26 Nov 2003). "STAGE TO SCREENS: HBO's "Angels in America" Plus a Chat with "Angels" Co-star Ben Shenkman". Playbill. Retrieved 15 June 2018. ^ "Angels in America". Rotten Tomatoes. Flixster. Retrieved November 21, 2014. ^ Critics Choice:Movies by Anita Gates, The New York Times, April 17, 2005. ^ TELEVISION REVIEW: HBO infuses `Angels' with new life Nichols, cast triumph in inspiring production By Matthew Gilbert, Boston Globe Staff, 12/5/2003. Love In the Time Of Reagan. CinemaQueer. Angels in America. National Center for Biotechnology Information, United States National Library of Medicine, review. Winged Victory. New York Magazine television review. America, Lost and Found. The New Yorker. How HBO, Mike Nichols and Tony Kushner Brought Angels in America to the Screen. Paste Magazine. TV: Gay characters, themes found more acceptance and popularity in 2003. Pittsburgh Post-Gazette. The Lector Effect. Slate Magazine review arguing that the miniseries "gets Kushner wrong". Angels in America. Variety review. Angels in a Changed America. The Village Voice. This page was last edited on 5 April 2019, at 15:52 (UTC).